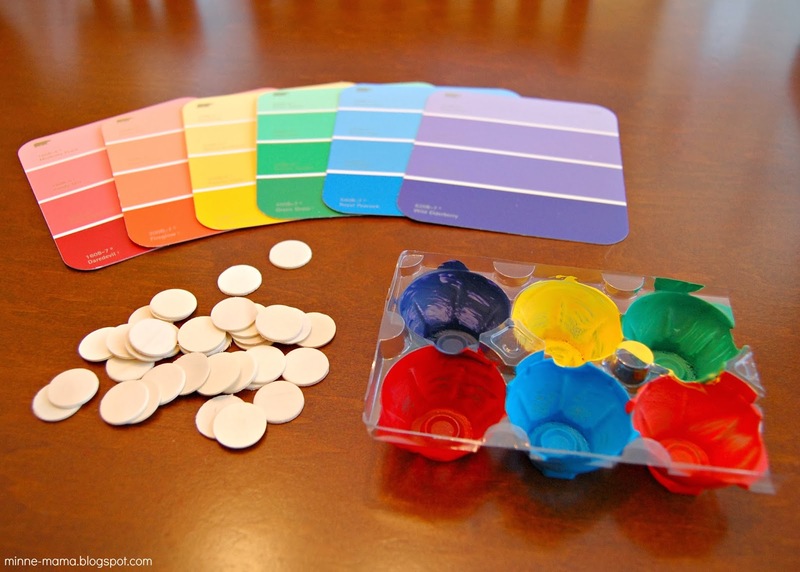 Last week, I talked about another craft we started with the paints that we mixed. 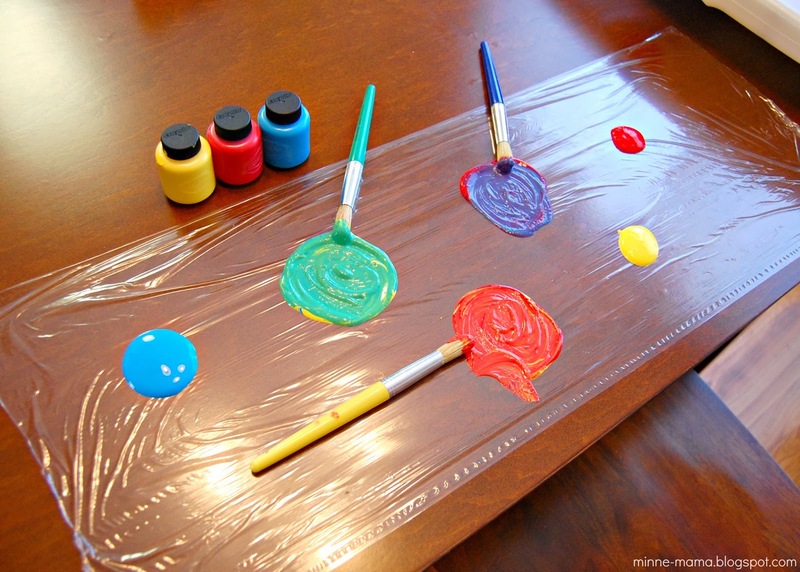 Our paint set has only the primary colors, so we mixed the secondary colors on a big piece of plastic wrap. Skyler loved it! 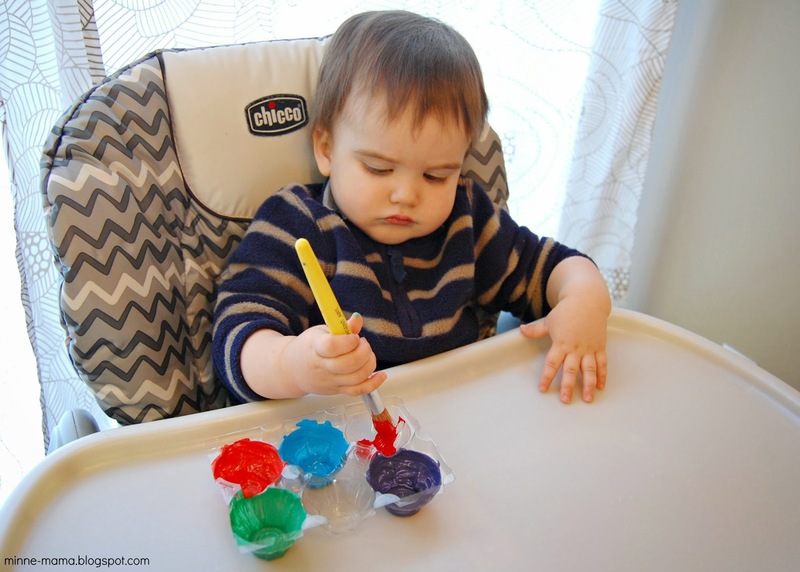 When we used the green paint to make our fine motor pipe cleaner caterpillar, we also used the paints to start this activity. 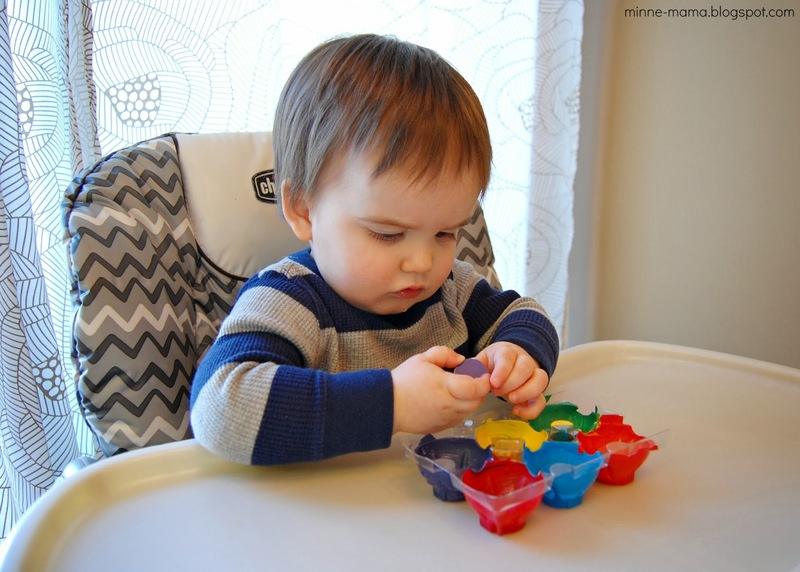 Along with the caterpillar, fine motor feathered birds, see through shakers, and Valentine cups for our sensory bin, this activity used recycled egg cartons. 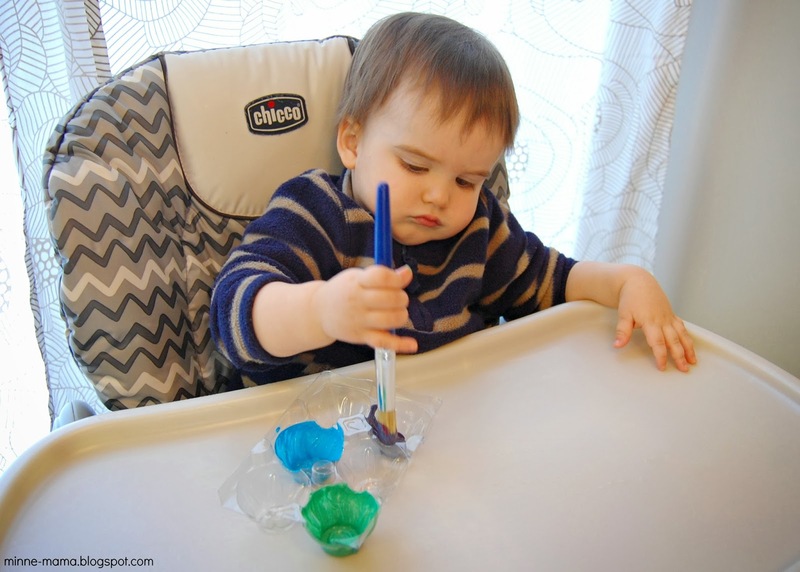 For this activity, Skyler painted a two by three piece of egg carton. One for each primary and secondary color. He did most of the painting, and I helped fill in the gaps. Our egg carton was left to dry, and I started with the sorting materials. 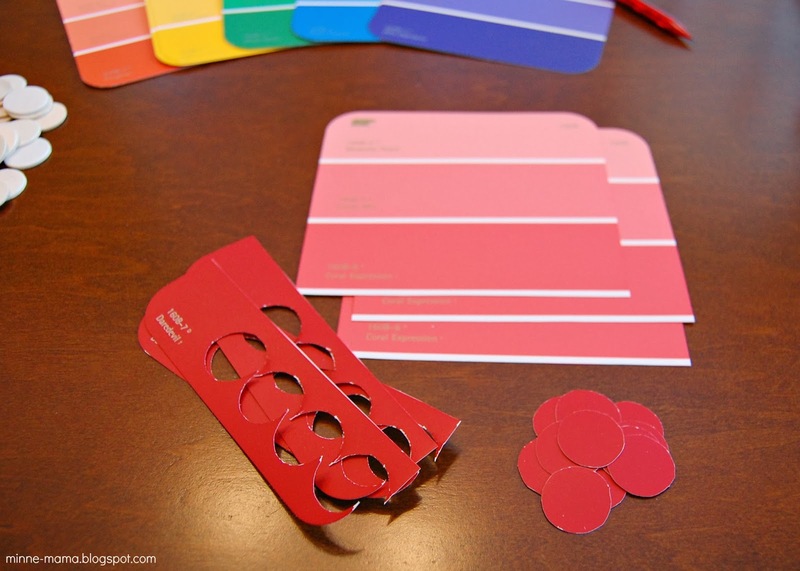 All we needed other than our egg carton were small wooden rounds and paint samples. I only used the bottom color on each, but have ideas for the other shades of samples. 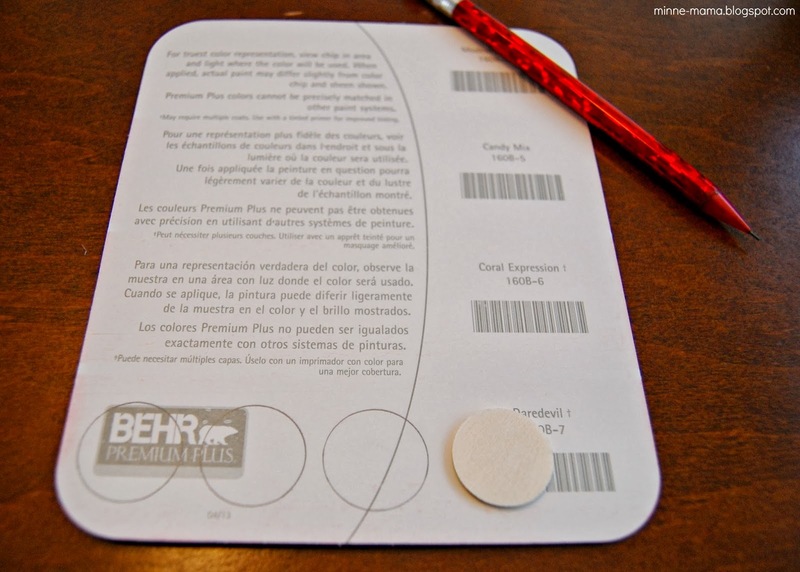 I started by tracing the wooden round on the back of the paint sample. I was able to fit four on each sample, and needed twelve of each color. I cut out all of the red circles, and started gluing them onto the wood pieces. 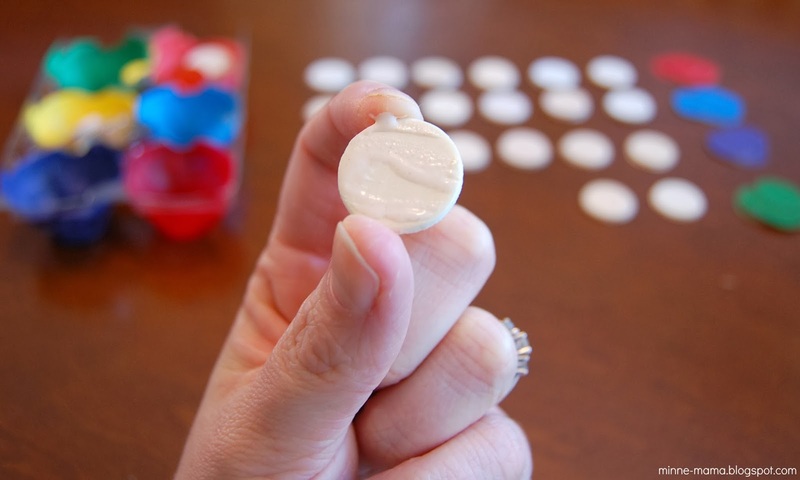 It can be seen on the far left circle, but white craft glue was not working for adhering the paint sample to the wooden rounds. Luckily I noticed them separating after gluing those three. 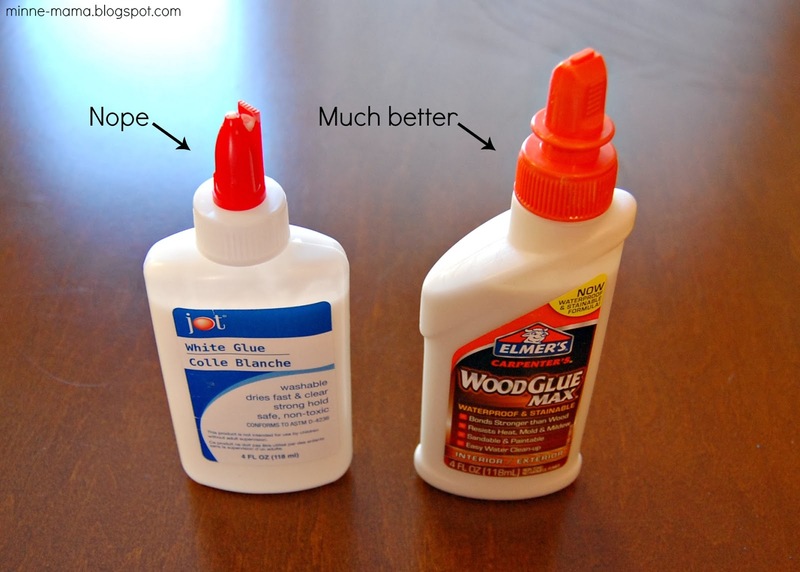 I grabbed our wood glue and gave that a try. It worked so much better. There was still a little separation, so when I finished gluing all of the paint circles on one side, I put a heavy book over them until they dried. I cut out all of the colors and then glued one side of each wood piece. 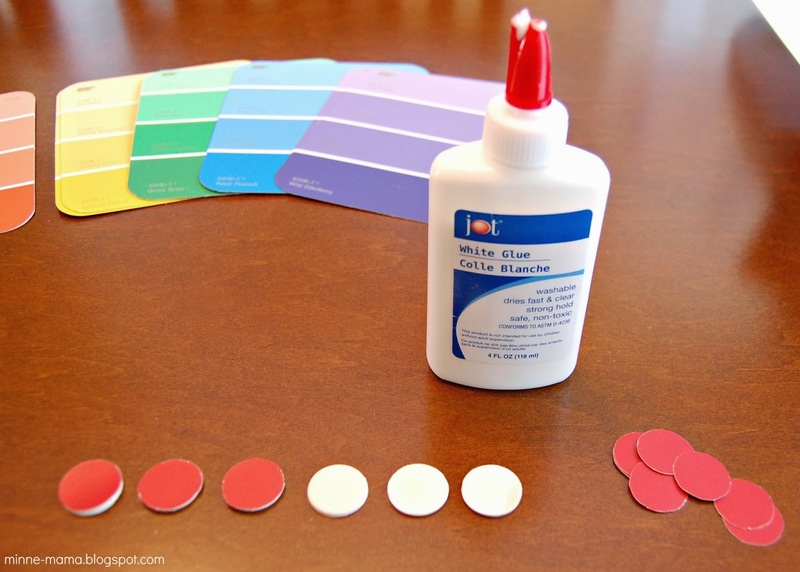 I glued the paint samples onto one side first, and then after that side was dry, I flipped them over and added a paint sample circle to the other side. 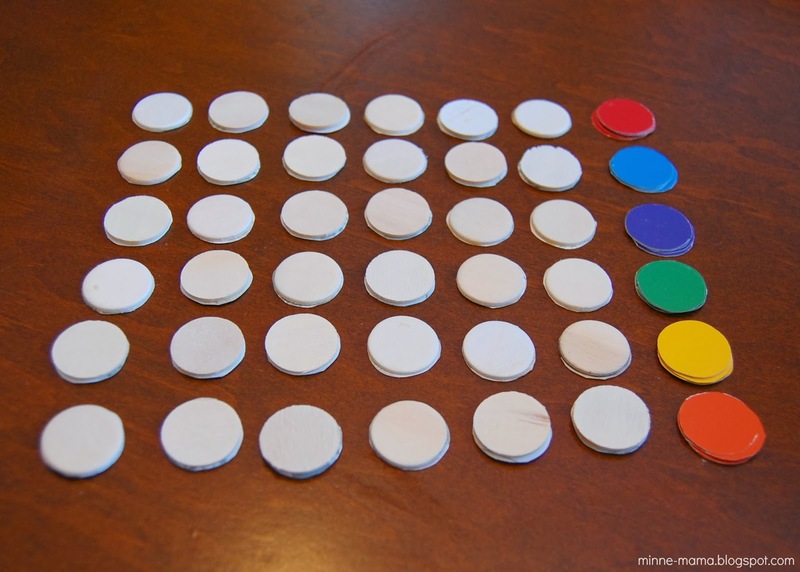 I kept track of which ones I had completed by lining them upside down next to the unused paint sample circles. When my minne-mister saw me cutting and gluing these, he had a good idea. I wanted the color on both sides, but he said it would be easier to use the sticky rounds for the bottoms of chairs. 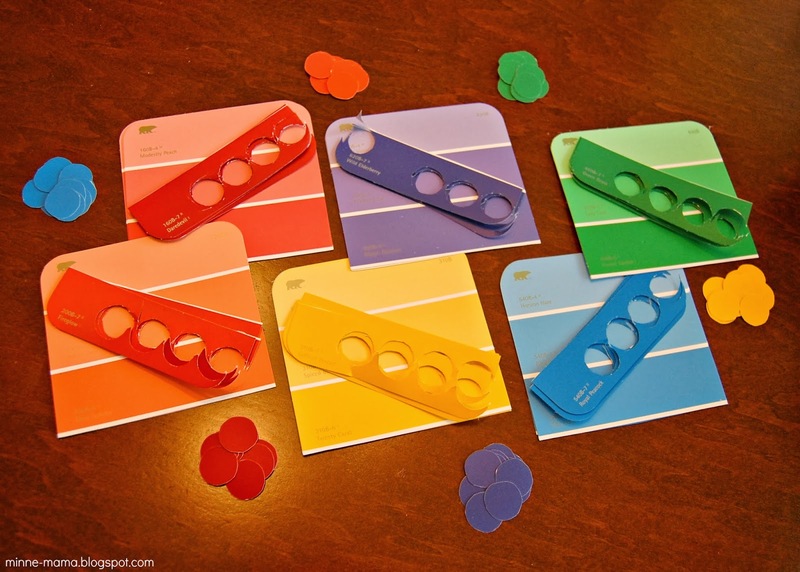 This would be much quicker, and for older children who do not need the color on both sides, all you would have to do it stick it straight to the back of the paint sample, eliminating the time needed to trace all of the circles. Then you would just need to cut around the chair bottom. 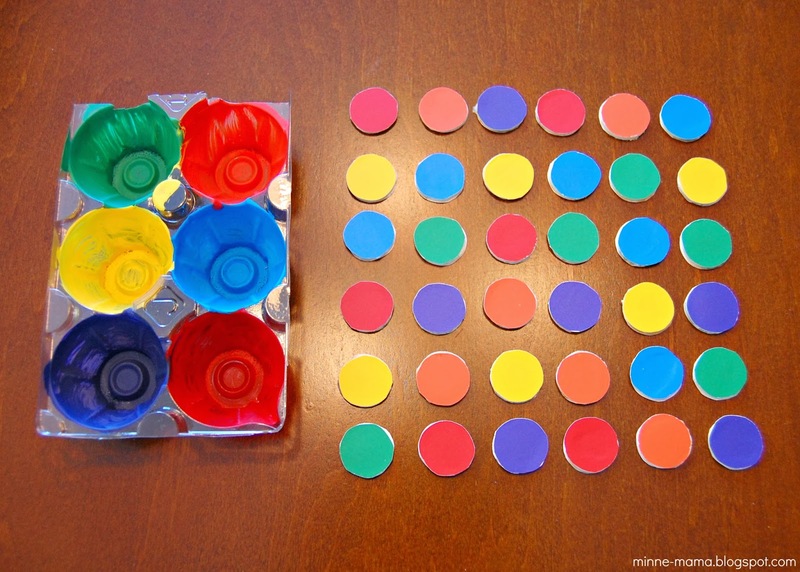 Another idea, if you do not want to trace and cut all of the circles, would be to paint one or both sides, or to dye the wood pieces. I wanted a really vibrant color that exactly matched the paint on the egg carton since Skyler is just learning his colors. All of these would be great options to create this sorting activity. Skyler is just learning all of his colors. 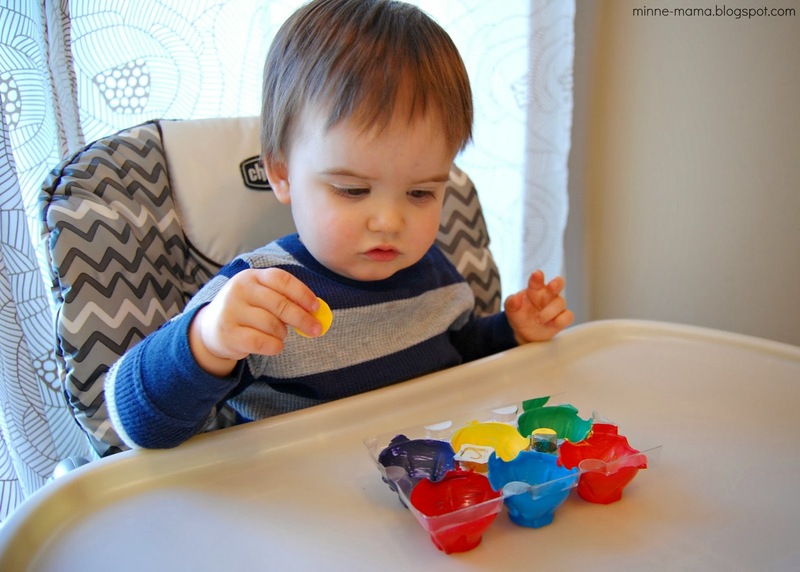 His favorite to say are purple and blue, though he can say all of these colors, and he can identify all six of these really well now. When we read the 100 First Words Book, we ask him questions like "Where is the green pear?" and he can always point to the colored objects we name. This was our first real attempt at sorting colors. 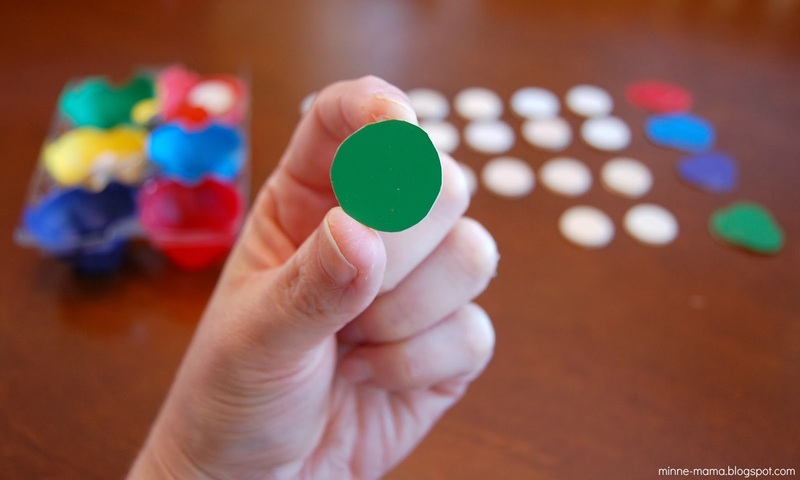 Since color sorting is a skill we have not really tried before, today I handed Skyler the wooden rounds individually. We would talk about the color I held and then I would ask him where the color was on the egg carton. After he looked at the carton and pointed out the color, I handed him the piece. 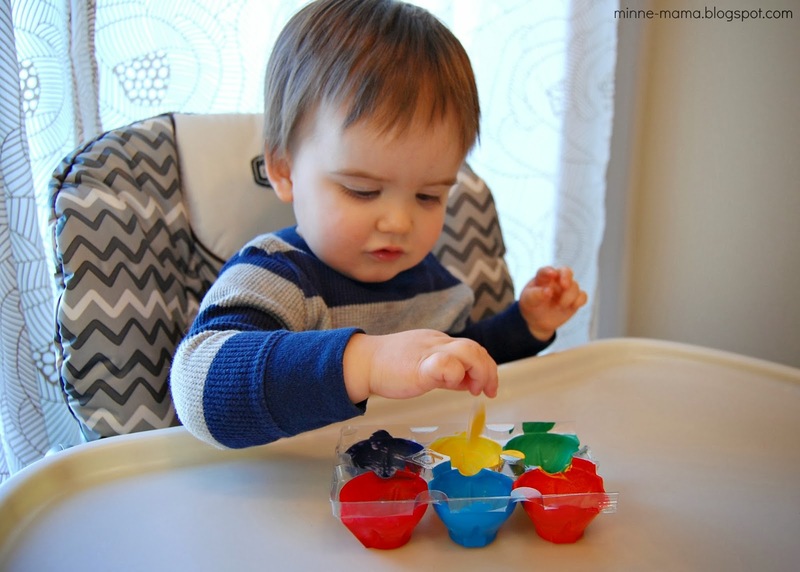 This way, he was usually able to put the colored pieces in the correct spot on the egg carton. It worked out well since I didn't want to overwhelm him with all of the colors at once and I wanted him to have success with the activity. 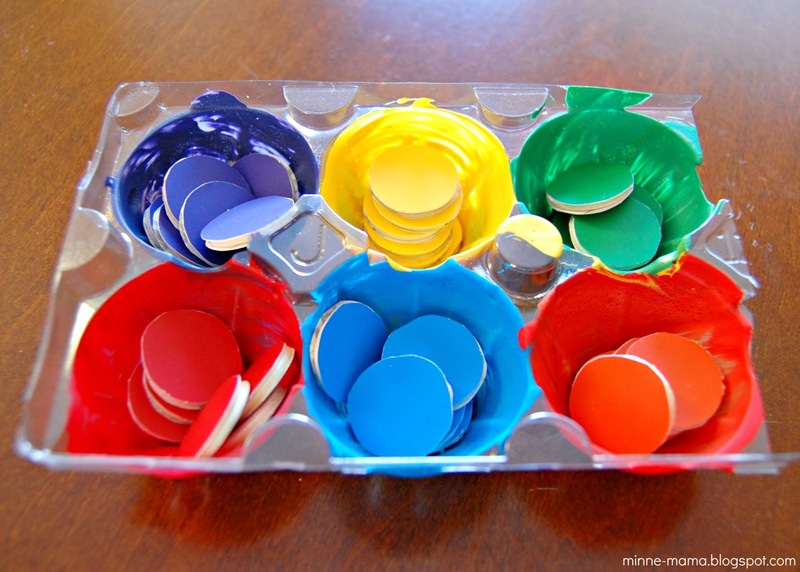 For awhile, we just had all of the pieces on the tray and filled up the holes, not focusing on the colors, but the sound it made. Usually, though, we were sorting them one by one. After a few times of playing with it, I know Skyler will be able to sort them more independently. He had a lot of fun playing our game today, it was challenging for him, but not too difficult. 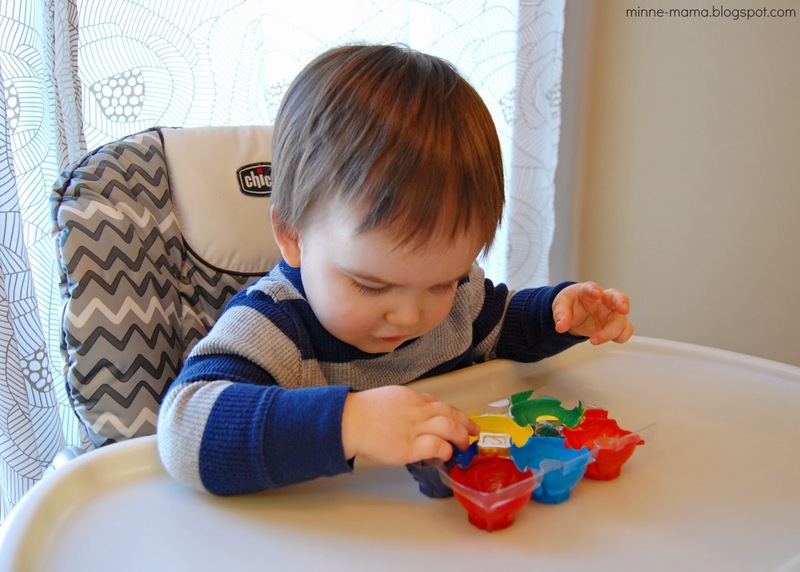 This skill building and enjoyable game is perfect for toddlers learning their colors and working on sorting, and I know that we will not only play with this a lot at home, but as a busy bag activity to take along with us when we are out and about. Thank you so much for the kind words. I am glad that you have enjoyed the blog! This is a fabulous activity Hayley! I will be sharing it on my FB page on Sunday. Send me and email at messforless at gmail dot com as I would love to talk to you about doing a guest post at some point in the future.